Home Culture Teens from Cullman’s sister city, Frankweiler, Germany, have arrived! Teens from Cullman’s sister city, Frankweiler, Germany, have arrived! CULLMAN – The Cullman Friends of Frankweiler organization welcomed special guests, 17-year-old Verena Rong and 16-year-old Antonia Poulsen, to Cullman this week. The two young ladies are visiting from Colonel John Cullmann's birthplace, Frankweiler, Germany. They arrived on Monday, July 18 and will be staying at the home of Ernest and Susan Martin Hauk through Tuesday, Aug. 2. Cullman and Frankweiler became sister cities in 1987. The Cullman Friends of Frankweiler and the Frankweiler Friends of Cullman organizations have worked together to create the Cullman/Frankweiler Student Exchange Program. The purpose of the program is to get young people from each city to learn more about the history, heritage and lifestyle of their sister city. Verena and Antonia are this year's exchange students. Since their arrival, the girls have become good friends with Ernest and Susan Hauk’s daughter, Samantha. Together they have visited some interesting places and have eaten some good ole southern food. On Wednesday morning, the girls visited with Mayor Max A. Townson at Cullman City Hall. He talked to them about lots of different things such as Colonel Cullmann, Volkswagen cars and Johnny Cash. During their visit the mayor presented them with a proclamation declaring July 20, 2016, "Frankweiler Exchange Student Day" in Cullman. Wednesday proved to be a very busy day for Rong and Poulsen. After visiting Townson, Drew Green from the Cullman County Museum took them inside the museum and gave them the grand tour. From there, they headed to the Space and Rocket Center in Huntsville. They had lunch and did a little shopping at Bridge Street Town Centre, also in Huntsville. They will end the day with a Birmingham Barons baseball game. Although their visit to Cullman has really just begun, the girls seem to be having a good time. Rong and Poulsen will go on many more adventures while in town. Not only are the girls learning about Cullman, but they are also teaching us a lot about our beautiful sister city, Frankweiler. For more information about Friends of Frankweiler call 256-739-1258, email friendsoffrankweiler.cullman@gmail.com or visit cullmancountymuseum.com. Whereas, the City of Cullman is grateful to both of our “Friends” organizations for keeping the lines of communication open between our two cities and for encouraging our young people to become involved in our Sister City partnership so that it can continue to flourish for generations to come! 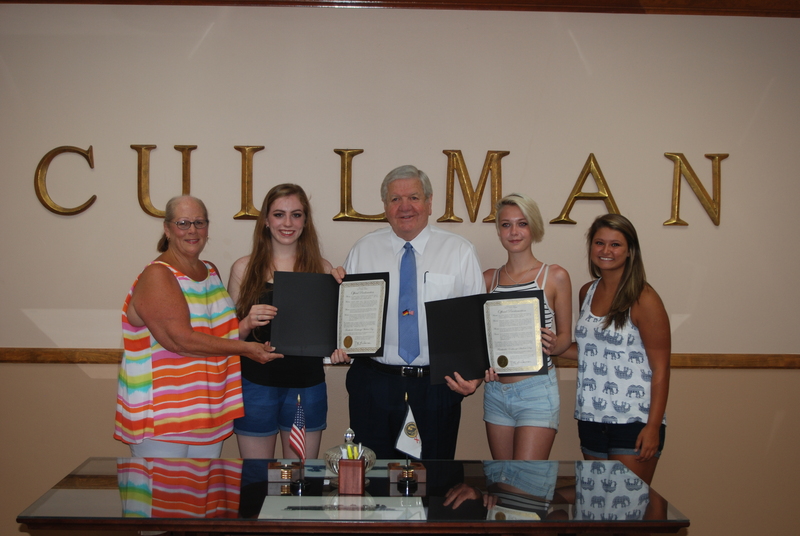 Now, therefore, I, Max A. Townson, as Mayor of the City of Cullman and on behalf of our City Council and citizens, do hereby welcome Frankweiler exchange students Antonia Poulsen and Verena Rong to Cullman and proclaim the day of their visit to the Mayor’s Office – Wednesday, July 20, 2016 – to be FRANKWEILER EXCHANGE STUDENT DAY in the City of Cullman, and encourage everyone in our community to tender to our honored guests a most cordial and sincere welcome to Cullman! In witness whereof, I have hereunto set my hand and caused the seal of the City of Cullman to be affixed on this, the 20th day of July, 2016. See a full photo gallery on our Facebook page.